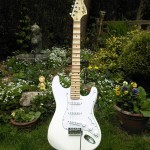 My first project; my brother Lee had been a fan of Yngwie Malmsteen’s since the early 90’s and we had both talked and dreamed about one day having enough money to buy one of Fender’s signature models featuring a fully scalloped fretboard. 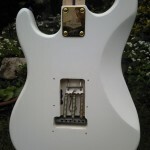 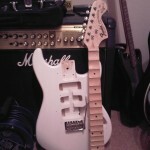 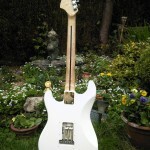 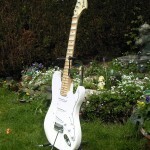 A scalloped fretboard like Yngwie uses is incredibly difficult to source on a retail guitar for less £1,000 so I decided to build my own ‘Partscaster’. 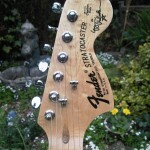 The ‘Duck’ tagline refers to Yngwie Malmsteen’s original Strat copy which he scalloped himself in the late 70’s. 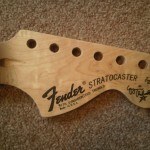 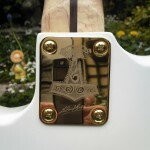 The headstock of this guitar had a Donald Duck sticker and the nickname reference is generally used. 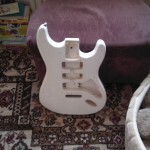 Sourcing components primarily through eBay, this was my first experience of creating a working guitar on a tight budget that played like a pro. 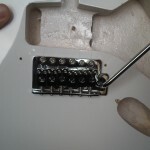 I was a little green at the time and so I bought a second-hand, ready wired scratch-plate and just connected the jack-plug. 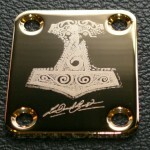 I commissioned the production of a unique neck-late featuring the owner’s signature and Nordic hammer design. 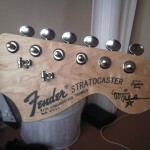 Plays very well, it’s let down slightly by the stock-pickups however. 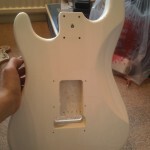 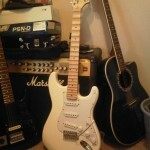 It would definitely benefit from a set of DiMarzio YJM Fury’s. 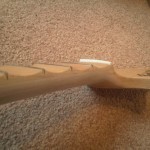 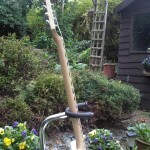 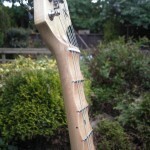 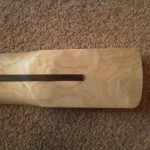 The neck, which was sourced from China, is very thick and is an acquired taste but excellent for big bluesy bends.